If metal expands when heated, how does heating a bolt loosen it? If you're having trouble removing a stuck bolt, common advice is to heat the bolt up. But if metal expands when heated, wouldn't heating up the bolt just make it harder to remove? How does heating the bolt get it unstuck? The answer is surprisingly simple: the bolt expands, but the nut expands more. 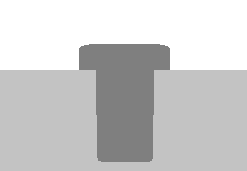 Now, since the nut's radius is slightly greater than the bolt's, and since the increase is proportional to the rest length, the nut expands a little more. Iron has a thermal coefficient in the 10-5 / K ballpark. It means that for each 1 K increase in temperature you have an increase in size of 10-5: a 1 m rod becomes 1.00001 m long. As you can see, before heating R - r = 1 μm, while after R - r ≈ 1.001 μm. It increased! Please note my numbers are quite wild and used just to make an example. I am sure that I got the starting values wrong, but I hope they help to get the message across anyway. The secret is constrained expansion. Here's some cruddy diagrams to help explain how it works. When the bolt is heated, it expands. Since the shaft of the bolt is constrained, it can't expand inside the hole. 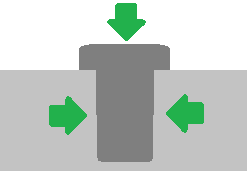 The bolt expands in the direction of the green arrow, but cannot expand in the direction of the red arrows. As the bolt cools, it contracts. The contraction, however, is not constrained. This means that the bolt can shrink in all directions, making the bolt slightly smaller. The bolt is able to contract in all directions. Once the bolt has cooled, it should be smaller and easier to extract. Many forms of rust contain "chemically bound water" and will lose that water (and shrink) when heated sufficiently. Metal arranged in a ring expands outward when heated. Imagine a ring of thin wire being heated--it expands primarily along its length, making both the inner and outer diameters larger. The same occurs with the material around a bolt hole. Generally, I try to heat the surrounding piece and not the bolt itself. However, even if the bolt is heated directly, conduction will usually result in heating of the surrounding material, and therefore expansion of the bore. Consider a washer, or some other metal ring or disk with a hole in it. When the ring is heated, we expect the ring to expand, and experiments confirm that it does expand. But does the hole in the ring expand, contract, or stay the same size? ...[T]hink about what you do when you are trying to open a Mason jar, and the screw-top metal lid is stuck. You either tap on the lid with a spoon (to try to jar loose any part of the lid that is stuck), or you place the lid under hot water. You do the latter because you know the metal lid will expand more than the glass jar, and so it will be easier to get the lid off. And by saying the metal lid will expand more than the glass jar, what we really mean is that the hole in the lid will expand. In my experience, you have to heat a frozen bolt until it is blistering, red hot and getting soft, and remove it while it is hot and soft. Heating the bolt and allowing it to cool has never helped me. As the metal contracts, the bolt seizes; it usually doesn't loosen... it probably makes the situation worse. The same is true for drinking glasses that have gotten stuck together... cold, contraction is the cause of the seizing. I think clarification of the answer is needed. The nut isn't expanding "more", it ends up larger but the % increase is the same. My perception of the effect of heating is that not only do the bolt and the nut or block expand, but also the space between them expands as well, dont' forget about that. I think there are multiple factors that contribute to this effect but I think one has not been mentioned. One other way to get a stuck bolt to release is to shock it by hitting it sharply. Generally this is something you do something large like a valve but I think the underlying problem is the same. For rust, I would expect that this can shatter the brittle structure of the oxide. Another factor is that there are two types of friction. There's static friction and kinetic friction. Consider a heavy (filled) cardboard box on a floor. If you try to slide it, it will initially be 'stuck'. Once the box starts moving, it slides much more easily. This is the same reason it's bad to lock up the brakes on a car. 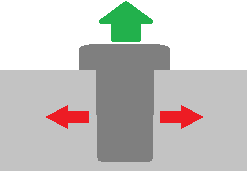 Once the rubber starts sliding, the friction is significantly reduced. Temperature is the measure of the average kinetic energy of the molecules of a substance. That is, the molecules are moving in any substance warmer than absolute zero and the faster they are moving, the higher the temperature. When you heat something, you are adding kinetic energy to the system. This is literally causing the molecules of the bolt to move more and more quickly. In a solid, the molecules are not moving freely in space and essentially vibrate. The following image is a depiction of how metal molecules move when heated. I think it's possible that this energetic movement could, by itself create the same effect as the shockwave caused by a sharp knock. That and an uneven change in size of the bolt and nut could break the static friction and/or shatter the brittle rust. I know that if you have a rusted cast iron skillet, one solution is to put it in a hot fire and the rust will simply fall off. Because heat does not travel instantly, the nut will expand more than the bolt... if you time things right... which is not trivial. For a bearing rather than a nut/bolt, this [induction] heating is an industry method of removal, as shown in this video for example, and even more so for affixing. The removal action is instantaneous in this case, once the bearing ring is heated enough. The issue with a nut/bolt is that a lot of heat may have transferred to the bolt, perhaps before you are done removing the nut. Quoting from a practitioner of this art "you want to heat the nut and not the bolt". The issue is further compounded by the fact that there isn't one single method of doing this. You can see in this other video that the nut gets much whiter than the bolt, which means it gets much hotter when heated. The catch is that by the time the nut is removed, neither is glowing anymore [in that last video], so we can't visually tell their temperature [difference]. Air however is a much better insulator, so I suspect that the bolt cools faster than the nut because it makes contact with more metal, which acts as a radiator. A video with a thermal camera would be definite proof, but I couldn't find one. The description of that last video also says that corrosive bonds are loosened by heating which may well be true as well, but I haven't checked the science on this bit; this claim also assumes that those bonds are not immediately restored by cooling. And for the scenario depicted in the questioner's own answer: it doesn't work like that in practice. If you watch the 2nd half of this half-hour video, the dude is carefully heating the frame around the bolt itself, and it takes a lot of time, patience and care to succeed when the "nut" is a large piece. I've got a simple answer that no one has said the head of the bolt expands off the surface loosening the tension off the threads thus making it loose enough to turn off. Sometimes bolts are too tight even when they are not rusted. I believe that if rust or sediment is a factor in preventing loosening, the high heat will cause the debris to looses with the heat and come loose, allowing for the bolt or part in question to turn with ease. Put a penny in a door jamb and close it. The door will be almost impossible to open, because friction will hold it in place. The flexing of the rest of the door will prevent it from moving. A rusted bolt is essentially the same principle - many small bonds formed on the threads of the bolts by oxidized metal prevent it from turning. The heat and expansion of the metal simply served to break those bonds. It has nothing to do with thermodynamics or any other science-y nonsense. It is the simple mechanical action of the expanding metal breaking the rust. Not the answer you're looking for? Browse other questions tagged removal bolts or ask your own question. How do I optimally cut a bolt to length? How can I remove stuck anti-vandal rings in tap head? How can I securely fasten a carriage bolt? How do I remove plastic shelving molly clips? How do I tighten/loosen this recessed nut and bolt? How to tighten a carriage bolt?